A delicious prawn curry that’s on the table in just 30 minutes. Served with herby naan bread for mopping up all the sauce, it makes the perfect Friday night supper. 1. Preheat the oven to 220ºC, gas mark 7. Heat 1 tbsp of the clarified butter in a large saucepan, add the onion, ginger, garlic and chilli and cook for 5 minutes until softened and golden. 2. Add the curry paste, coconut milk and tomatoes, cover and simmer gently for 10 minutes. 3. Meanwhile, spread one side of the naan bread with the remaining tablespoon of clarified butter, sprinkle with the cumin seeds and bake for 5 minutes until warmed through and toasted. Scatter with chopped coriander. 4. 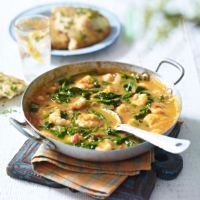 Stir the spinach and prawns into the curry and cook for 2 minutes until the prawns are pink and cooked through and the spinach haswilted. Ladle into bowls and serve with the coriander naan. If you prefer to grill the naan, toast one side under a medium grill for 2 minutes, turn, spread the second side with clarified butter and sprinkle with the cumin seeds then return to the grill until warmed through. Scatter with coriander before serving.